SmartAG provides an end-to-end cloud deployment solution for connecting hardware and software to Alibaba Cloud. Smart Access Gateway (SmartAG) provides an end-to-end cloud deployment solution. 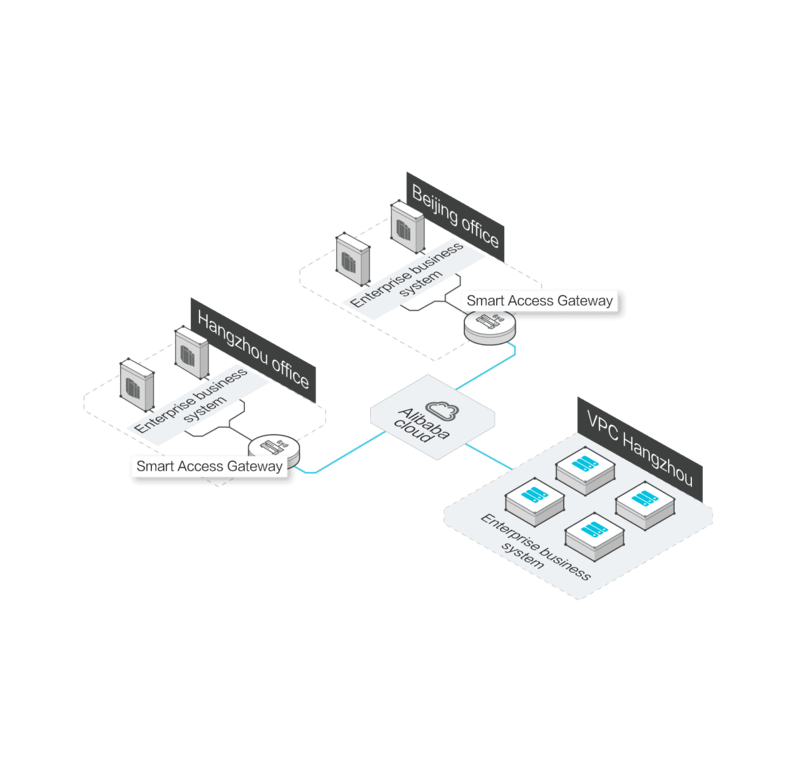 This allows enterprises to connect to the nearest VPC through encrypted connections, and enables intelligent, reliable, and secure business system deployment on the cloud. SmartAG is a highly automated and out-of-the-box service. It automatically converges the network to adapt to topology changes. Users can connect to the VPC that is nearest to their region. Device and link failover ensures that your on-premises business systems can establish reliable connections to the cloud. The on-premises systems are connected to VPCs through encrypted connections. Data is encrypted for secure transmission over the Internet. Allows you to centrally configure and manage all hardware that is connected to SmartAG. Data is encrypted to achieve secure data transmission. Internet Key Exchange (IKE) and Internet Protocol Security (IPsec) are used to encrypt data. Authenticates data sources to prevent replay attacks. Provides multiple methods to authenticate data. Provides multiple access modes for different networks. You can use your broadband Internet services to connect to Alibaba Cloud. You can use 4G networks to connect to Alibaba Cloud in areas that do not provide broadband or Wi-Fi services. Supports gateway and link failover to ensure high availability of your services and eliminate single point of failures (SPOFs). Active and standby gateways are deployed to support failover. Each gateway provides two encrypted links to achieve the optimal link selection and real-time link failover. Provides a console for configuration management and network monitoring with multiple metrics and alarm settings. Hardware connected to SmartAG is centrally managed and configured in the same way as other cloud resources in the console. High-quality hybrid clouds can be built easily. 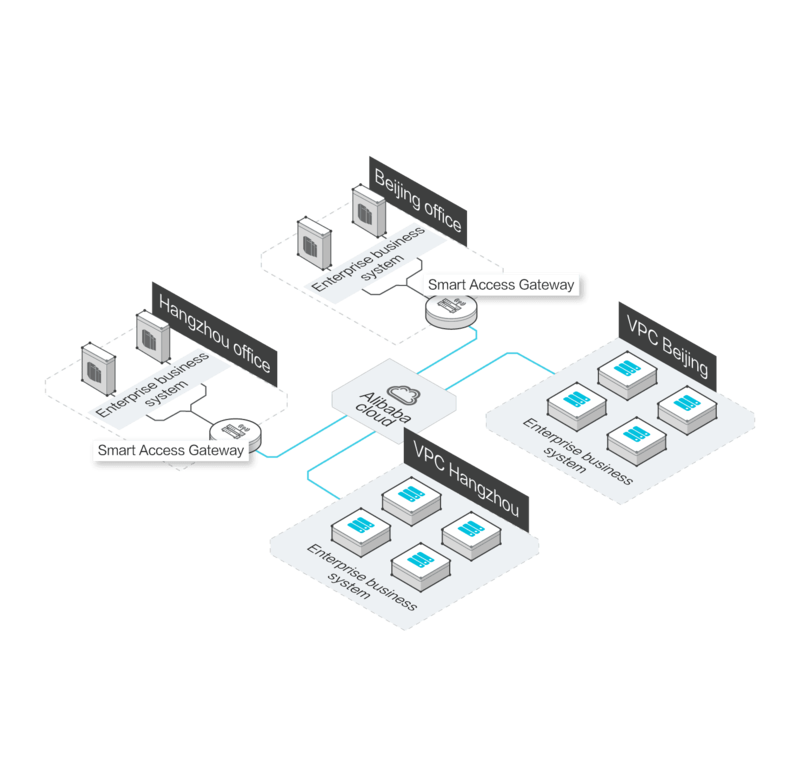 On-premises branch facilities, such as data centers, institutions, and stores, are connected to VPCs through SmartAG, and use resources in the cloud for auto scaling. You can use SmartAG to build a secure, high-quality, and highly available hybrid cloud within one day through simple configuration in the console. SmartAG provides centralized management in the cloud, and automatically detects topology changes on all nodes and then distributes routes. You can access an Alibaba Cloud VPC that is located in any region. On-premises branch systems are seamlessly connected to Alibaba Cloud, with your cloud services deployed in multiple regions. SmartAG allows you to deploy your business in multiple regions so that users can access the nearest node. Backend systems and VPCs are connected through SmartAG to achieve secure and stable data transmission. Services are deployed in VPCs across regions. This allows users to access the nearest VPC. Sensitive data is transmitted in VPCs to prevent data leakage. Services are deployed in multiple regions to achieve disaster recovery and backup across regions. Use SmartAG to deploy your project on Alibaba Cloud in 10 minutes. APIs and SDKs for developers. View more Alibaba Cloud services.